The term “climate finance” in the narrow sense refers to financial support by industrialized countries to help developing countries mitigate greenhouse gas emissions, protect tropical forests (because of their important role as natural carbon sinks) and adapt to the effects of climate change caused by global warming. Climate finance is based on the United Nations Framework Convention on Climate Change (UNFCCC) of 1992, in which the industrialized countries pledged to support the developing world through new and additional funding to combat climate change. This financial support is also part of a fair burden sharing in global climate protection based on the differences in responsibility in causing climate change and the (economic) capacity of the respective countries to curb it to the greatest degree possible. Since climate change entails additional burdens, many developing countries are calling for climate finance to be provided in addition to development finance. This proposal has received a cool reception among rich countries that see climate finance as part of their development aid and thus expect it to be credited as far as possible to their decades-old pledge to raise expenditures on official development aid (ODA) to 0.7% of their gross national income (GNI). In a broader sense, the term often encompasses all public and private financing that serves to mitigate or avoid greenhouse gas emissions, transform energy systems, contribute toward climate-friendly development, assist in adapting to climate change, and recently also to manage unavoidable loss and damage arising from climate change – i.e. not only financial support for developing countries, but also the use of public funds at home as well as private (or public-private) investments. It was not until 2009 that the UNFCCC’s general commitments were translated into more specific terms. Although the climate conference in Copenhagen that year failed on most of the key issues, it did see the industrialized nations committing a total of $30 billion in new and additional funding for the period from 2010 to 2012 as “fast-start finance.” Chancellor Angela Merkel pledged €1.26 billion as the German contribution to this sum. In Copenhagen, the industrialized countries also promised to increase overall climate finance to $100 billion per year by 2020, mobilizing the required resources from public, private, and alternative sources. The question of how this promise was to be fulfilled was not answered at the time, and it remained a point of contention for many years in the UN negotiations for a new climate treaty. Before this background, the industrialized countries published a status report on the $100 billion pledge in 2015 that showed that public funds had reached an annual level of nearly $41 billion over the 2013/2014 period. In 2016, the industrialized countries supplemented the status report with a roadmap indicating how they intend to meet their $100 billion pledge, thus fulfilling a long-standing demand from the developing countries. According to the roadmap, the annual level of public funding is set to grow by $26 billion by 2020. The remainder of the funds needed to reach the $100 billion mark is to be covered by private investments. Both the status report and the roadmap were criticized regarding the methodology by which the industrialized countries generously chalk up available or mobilized funds, thus artificially inflating their figures (more on this here). Under the Paris Agreement, climate finance continues to be one of the keys to achieving the international community’s goals of limiting global warming to well below 2°C, and in particular to helping the poorest and most vulnerable countries adapt to climate change. Article 2 of the agreement requires all parties to reconcile worldwide financial flows with development that is both climate-friendly and promotes resilience against climate change. The international obligation of the rich countries to support poor countries financially already enshrined in the UNFCCC is thus being maintained. 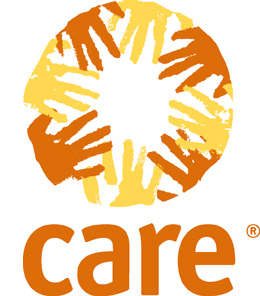 A new aspect is that all other countries are also invited to contribute voluntarily to support poorer countries. Furthermore, it was decided in Paris to maintain the level of $100 billion a year to be reached (hopefully) by 2020 until 2025 and to set a new finance goal for the following years. This of course means that climate finance will remain one of the most important issues at the annual UN climate conference. The results of the negotiations were supplemented by a series of announcements and pledges by the donor countries and by development banks regarding the future funding of climate finance. Rich countries use the traditional channels and instruments of development cooperation in order to implement climate finance in compliance with their international obligations. The largest share of climate finance (just under $23 billion annually in 2013/2014) is provided through bilateral cooperation in the form of grants or loans that are often combined with or integrated in traditional development cooperation projects and programs. In the case of Germany, these are predominantly realized by the German Association for International Cooperation (GIZ) and KfW development bank. Bilateral climate finance mainly consists of grants and loans. A number of multilateral (climate) funds are also open to the donor countries, including the Green Climate Fund (GCF) and numerous other special funds. 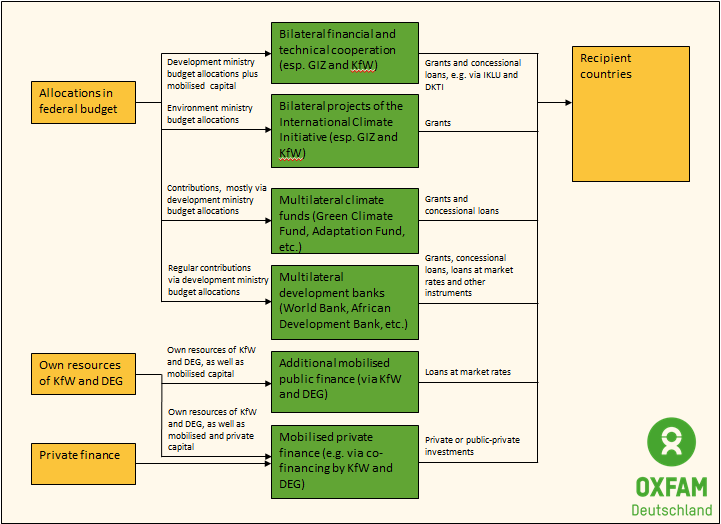 The multilateral development banks, whose budgets receive regular contributions from the donor countries, are now also financing climate projects on a large scale using a wide range of instruments. An annual average of just under $18 billion was made available via multilateral channels in 2013/2014. The industrialized countries would like to cover a significant share of their $100 billion pledge by “mobilizing” private investment. This currently accounts for a total of nearly $15 billion a year (annual average for 2013/2014). These are primarily instruments in which the KfW or other public actors create incentives for private investment through co-financing. While private investment can hardly be declared a contribution by the rich countries toward fulfilling their international obligations, they insist on crediting mobilized private investment toward their $100 billion commitment – the wording of the 2009 pledge was kept suitably vague to help reduce pressure on their strained public budgets. Germany supports developing countries in all three areas: emissions reduction, forest conservation/REDD+ and adaptation to climate change. Most of the funds are made available through the bilateral development cooperation of the Federal Ministry for Economic Cooperation and Development (BMZ), and a part through dedicated bilateral instruments and initiatives such as the Initiative for Climate and Environmental Protection (IKLU). A smaller (but important) share of climate finance is provided by the International Climate Initiative (ICI) of the Federal Ministry for the Environment, Nature Conservation, Building and Nuclear Safety (BMUB). Furthermore, Germany regularly contributes to multilateral climate funds, including the Green Climate Fund (GCF), the Least Developed Countries Fund (LDCF) and the Adaptation Fund (AF). Germany also supports the budgets of multilateral development banks, which in turn finance climate projects. 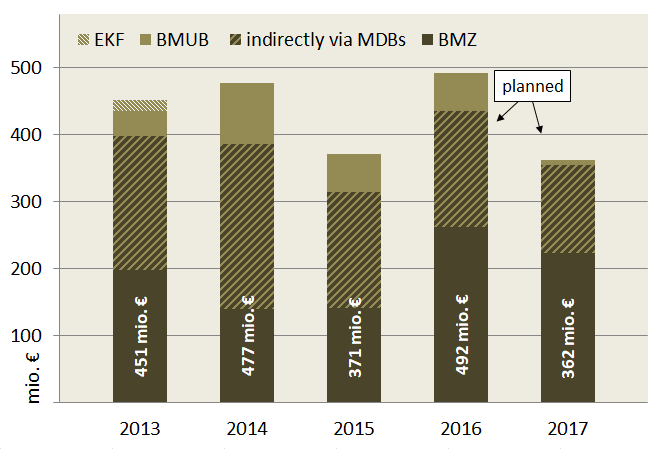 Germany remains a major donor, and German funding has increased in recent years (even though the government’s official figures are subject to creative accounting as shown here, Fig. 2). The German government has repeatedly emphasized that the country will make its fair contribution to international climate finance. While there is no internationally agreed basis for allocation of the $100 billion pledge, the government unofficially considers about ten percent of the $100 billion to be Germany’s fair contribution. In 2015, Chancellor Angela Merkel announced that German public funding for climate finance would double by 2020 in relation to the figures for 2014, thus raising the pressure on other donors (even though the “doubling” does involve a certain degree of trickery as well). In any case, the funds provided by Germany must continue to increase. Like the other industrialized countries, the German government does not intend to cover the German contribution solely with public funds, but to count private investment as well. These plans are highly problematic. They mean less public funding, and thus fewer opportunities to mobilize additional private investment, and ultimately less climate protection and less direct support for adaptation to climate change. 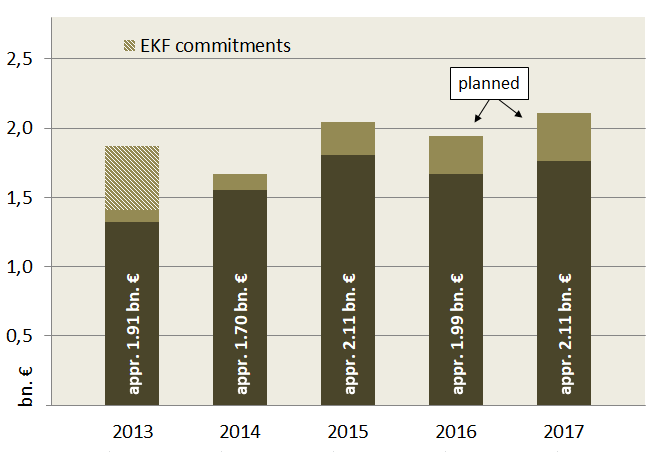 While funds from Germany have increased in recent years and have financed many useful projects and measures, the government has not yet presented a coherent climate finance strategy, nor a detailed scenario for how Germany intends to increase its funding in the coming years. As is the case with development finance, the quality and impact of the deployed funds is a key factor in climate finance, in addition to the fulfillment of quantitative commitments. A basic precondition in this regard is transparency. A critical monitoring of German climate finance (by this website and other parties) is not possible without information about what Germany is financing, who is involved in the implementation and the impact of the measures. The government has made considerable progress here in recent years, for example in publishing information on the financed projects. Climate finance is intended to provide lasting support for poor countries in taking a climate-friendly development path and adapting to climate change. In particular, climate protection funds must not lead to the establishment of long-term emission paths that would lock countries into emission levels that, while lower overall, would still be deemed too high for the coming decades. From this perspective, investments that keep the fossil-fueled energy sector alive rather than swiftly replacing it with systems based on renewable energy are simply inappropriate and counterproductive. At the same time, the financed measures should also contribute to the overall sustainable development of a country and the fight against poverty. Good climate finance also takes other aspects into account, including but not limited to adequate participation by local communities and civil society, which is a vital prerequisite to aligning climate projects with the needs of people and establishing them on the ground over the long term. Further key development policy criteria for good climate finance are gender sensitivity and the promotion of human rights. Climate finance must therefore be embedded in comprehensive, sustainable development and climate risk management strategies and should be consistent with them. Climate protection and development must therefore always be considered together when identifying measures. It is wrong, however, that most industrialized countries – including Germany – use this essentially sound understanding of the implementation of concrete measures to be unduly generous in crediting measures toward the $100 billion pledge in cases in which climate protection is but one of many sub-goals, thus artificially inflating their climate finance figures.